We all use Control panel in Windows OS. Control panel gives you access to perform lots of tasks in Windows, including Hardware and Software management, Device and Network Setup and other tools. After the release of Windows Vista in November 2006, Windows introduced a new “windows immersive control panel” Called “God Mode”. The Windows “God Mode” is however not officially introduced by Windows. “God mode” is a advanced Windows master settings that let you access your Windows Control panel in easy and more advanced way. In order to enable Windows “God Mode” you need to create folder and rename it with a special combination of God mode codes. 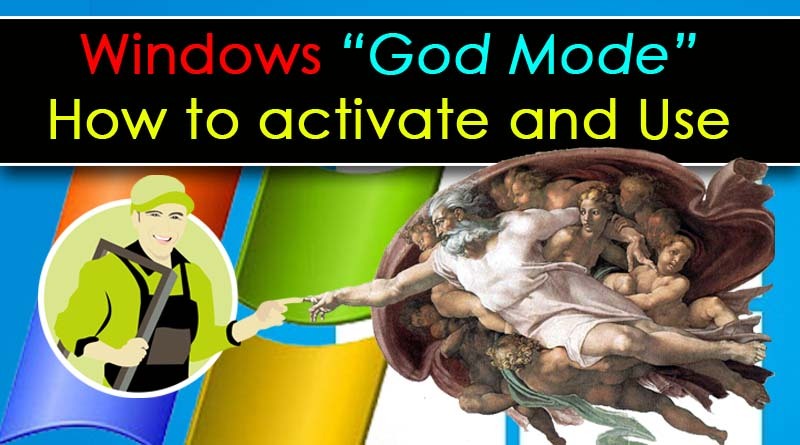 God mode can be activated and enabled on all version of Windows including 32-bit and 64 bit Windows. In order to enable God mode in Windows 8 , 8.1 and 10 you need to create a folder in any location of you Computer including Desktop or inside any partition of you HDD. If everything done well, your folder icon will change into default Control panel icon. Congratulations you have just activate “God Mode” for your Windows. After you have successfully created the God mode folder you can use this to perform plenty of tasks in Windows. Windows “God Mode” arranges everything in a subcategory which makes it easy to access and understand for user. With Windows “God Mode” you don’t need to be a pro to use advanced features of windows which was not easily accessible prior. you should only make GodMode with a folder that is empty else you will not have access to those files once the folder has been renamed. While this might sound like a neat way to hide your sensitive files, it can be a bit scary if you’re not sure how to get your data back. In order to get rid of God Mode you just simply need to delete the shortcut or the folder you have just created by renaming.